Diplomatic tensions between Japan and Russia have become extremely tense over naming rights. 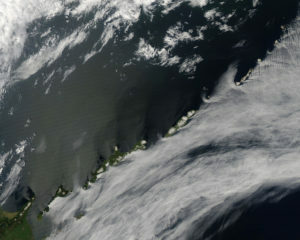 Japan has filed a formal protest against Russia’s decision to give names to five uninhabited islands in the Kuril chain. Located in the Pacific Ocean, just to the North of Japan’s Hokkaido Island, the chain has been a source of contention between the two for nearly a century. The act of naming is not the only reason for Japan’s ire, but also the onomastic inspiration for the name. For example, one of the disputed islands has apparently been named after General Kuzma Derevyanko. According to CNN, it was General Derevyanko “signed the Japanese Instrument of Surrender with the Allies in 1945”. The Japan Times has also covered this international dispute over names and territory.